There are a myriad of books on the basic steps of succession planning. My experience correlates with the following breakdown of three categories: (1) Board Responsibilities, (2) Preparatory Steps, and (3) Final Implementation. Most succession plans within these three categories include some variation of the following ten aspects to insure their successful implementation. 1. Establish Board Ownership, Involvement and Oversight: Ultimately the board is responsible for the long term well-being of the organization. In family-owned businesses this can become confusing as the boards can vary from an advisory group to a quasi-governing board. Regardless, the duties, responsibilities, authority, and required communications between the board and the CEO and between the board and the succession candidates should be defined as part of the succession planning process. Without it, the organization has no governing body to guide them through the potentially treacherous waters ahead. The worst case scenario is that a succession plan becomes frozen by a CEO that will not leave and will likely have to be terminated in order to move it forward. In such cases, this often leads to a board split and/or a needless blemish on a CEO’s legacy. This can happen in both public and private organizations. 2. Set succession time frames: The board must insure that a time line for the succession plan is created. Without definitive milestones to measure against, confusion will reign over the process at four key points. First, without a time frame to define the process and select candidates, the plan is unlikely to get off the ground until much later than is ideal, probably because of a crisis related to illness, death, or departure. Second, the development phase for the candidates should be sufficiently defined in terms of executive education, stretch assignments, and executive development. This must be shared with the candidates. Third, the retirement date of the CEO must be negotiated and established. A common oversight in several succession plans is failing to provide a transition plan for the CEO. Hence, the CEO remains busy with the business and the succession plan, then suddenly faces an unexpected transition into retirement that can lead to unnecessary conflicts between all parties. Fourth, without implementation of the three prior action steps , the succession candidates have no point reference for when a decision will be made. More importantly, without a firm CEO retirement date, it is highly possible that the candidates will become frustrated and take their talents to another company. 3. Prepare for emergencies: There are many pitfalls in any succession plan. In terms of succession planning, there are three emergencies that will require immediate board attention. (1) Illness to the CEO or candidates, (2) a sudden departure of the CEO or the succession candidates as the transition date approaches, (3) the urgency for the transition speeds up due to the condition of the organization, the inability of the CEO to lead, and/or it is revealed that the successors will not meet the needs of the organization. Generally, boards do not prepare for such events until the actual crisis occurs. This results in a rudderless organization during a critical time. At a minimum, the board should have a contingency plan to share with the organization and all stakeholders. 4. Align strategy and profile: The board needs to vet the candidates prior to starting the plan and then provide guidance and feedback throughout the development and evaluation process. Clear alignment with the board in terms of strategy and direction of the organization should be part of the ongoing evaluation. Critical success factors should be defined in terms of what is expected from each candidate. A formal feedback process should be developed and enacted picture of the anticipated roles, responsibilities, authority, and communication that they seek from the candidates. These will need to be communicated multiple times as it is rare that the candidates make the same meaning of these guidelines as the board. It requires time and repetition to get in sync with each other. 5. Build a talent pipeline: The board needs to have established a talent pipeline that runs two to three levels deep into the organization. It is much better to look at succession planning as an ongoing process for all leadership positions than to focus exclusively on the CEO. Smaller organizations tend to miss this opportunity to insure the future is secure with leadership prospects. It will behoove the board to join the organization’s HR/talent executive to fully define the purpose, operating principles and driving values to ensure that the pipeline grooms leaders for moving up the ladder while providing clear indicators when each person has reached their top rung on the ladder. 6. Source external talent and manage search firms: If there are no internal candidates for the CEO succession, then the board will need to seek external candidates. Determining the level of involvement in the search process as well as in defining the expectation of the search firm should never be delegated. The board must have at least one member directly involved in the process. 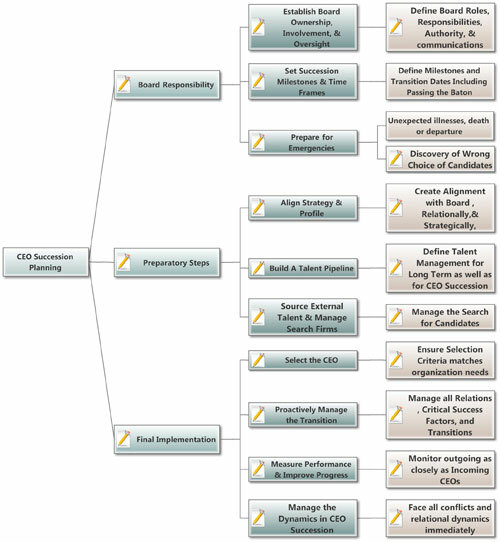 Some boards manage the search process completely through a search committee. Others form an ad hoc relationship with the HR executives. Regardless of the structure, the board should maintain ultimate control of the process. 7. Select the CEO: The board is ultimately responsible for the selection of the new CEO. In family-owned businesses, the board may not have such authority but needs to significantly participate in the process including providing wise counsel to the family. A critical aspect of board involvement is to create a clear description of the expectations both by the board for the outgoing CEO and for the new CEO coming onboard. It can be in the form fully defining what each expects. Interestingly, many smaller firms do not complete this process and later have massive explosions that were unnecessary and could have been avoided had more definition been provided and negotiation occurred in the beginning. 8. Proactively manage the transition: As the success time frame described above provides a chronological road map, the transition has three processes that require specific attention: The outgoing CEO transition as a moving process that must meet specific milestones to transfer duties and authority; the incoming CEO transition as a process moving from one organization to another; and the new CEO as a process to create an understanding of the organization and to begin to have an impact of the strategy and direction of the organization. Failure to manage any of these three transitions could be fatal to the succession process. 9. Measure performance and improve progress: As noted above, the board needs to stay involved and provide feedback on the critical success factor. Often the focus is only on the performance and progress of the candidates. However, a major pitfall is to not measure the outgoing CEO’s performance and to require improvement in the transition progress. 10. Manage the dynamics in CEO succession: Throughout the succession process, the board must assess the interpersonal dynamics between the outgoing and incoming CEO. The peacemaker must be the board as power dynamics can become quite irrational as the incoming CEO wants the reins and the outgoing CEO may not want to let go. In such situations, a power play can evolve that disrupts the entire organization as two leaders in disagreement stalemates the organization until fully resolved. CEO succession planning is fraught with pitfalls. These can easily be managed if companies take the time to negotiate through each of the ten steps described above. In the next issue we begin to address the coaches role in the succession process. Dierickx, Constance, and Juleen Veneziano, Three Keys to CEO Succession: Expectations, Choices, and Integration, People & Strategy, RHR International, Vol 31-2, 36-43. Favaro, Ken, Per-Ola Karlsson, & Gary L. Neilson, CEO Succession 2000-2009: A Decade of Convergence and Compression. Strategy & Business, Booz & Co, Issue 59, Summer 2010, Reprint 10208. Laffley, A. G. The Art & Science of Finding the Right CEO, HBR, Ocober, 2011, Reprint R1110C. Nohria, Nitin, William Joyce, and Bruce Robertson. What Really Works, HBR, July 2003, Reprint RO307C. Saporito, Thomas J. & Paul Winum , (2012) Inside CEO Succession: The Essential Guide to Leadership Transition, Jossey-Bass. Guthridge, Matthew, Asmus B. Komm & Emily Lawson., Making Talent A Strategic Priority, McKinsey Quarterly, 2008, No. 1. 49-59. Somaya, Deepak & Ian O. Williamson, Rethinking the ‘War for Talent’ MIT Sloan Management Review, Summer 2008, Vol. 49, No. 4. 29-34.